I know, I know! Cobwebs are growing in my blog! I have a good friend who is a loyal reader of my blog and she deliberately dropped me a note to inform me that she spotted cobwebs on my blog! Horrors! I've kept this blog chugging along for more than 7 years now (confetti!!!) so, no worries, I'm not about to let it die anytime soon. So what have I been busy with? Well, you know I have three kids... and a big baby! No, I'm not pregnant (I'm just FAT. sigh). It's my business My First Games, I'm talking about. All you entrepreneurs out there would know, that having your own business is like having another baby. It won't thrive unless you tend to it. As people never fail to remind me, for business owners, being busy is good, coz it means there's business, right? Yep! Suddenly a whole flurry of orders came in and I was busy filling them. I've also had to do restocks, ordering games from overseas, and having to deal with shipping them over to Singapore. We're also working on a whole new e-commerce based website to take over the current one - lots of sweat over this one. And on top of it all, I've nominated myself for the Singapore Mumpreneur Award! Oh the shame of self-nomination, I thought! "Self-praise is the world's most international disgrace" my sister and I used to say to each other when we were kids. What can I say, self-nomination got me a discount for my booth at the Mama's Bazaar 2014, so there! But apparently, every nominee IS self-nominated because they ask for so much information that it's impossible for anyone but the business owner herself to nominate herself. So there's me, listed as a nominee here in this link, under My First Games, of course. Oddly enough, some people I talk to actually think Tan Family Chronicles is my "business"... er, I wish? I can't recall if voting is required. I'd let you guys know if it is, and you be nice and vote for me, okay? 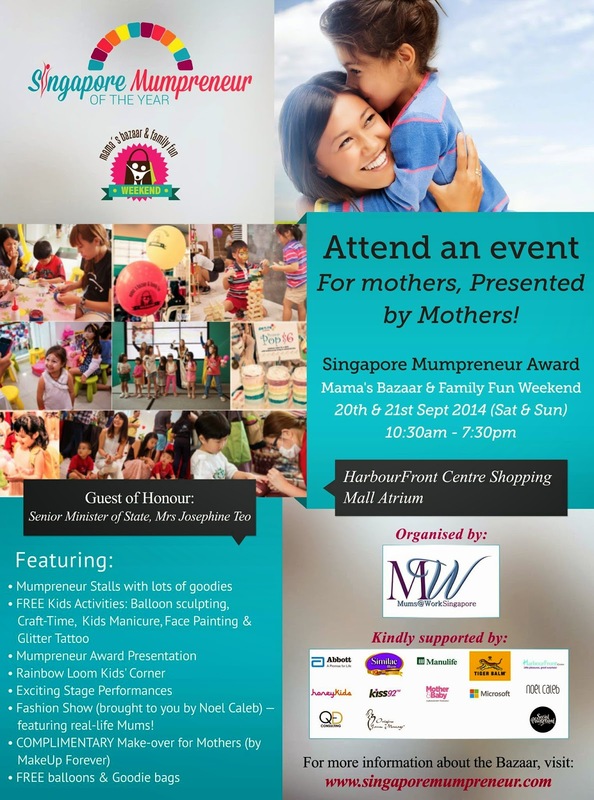 Oh and whether I win or not, come look for us on the weekend of 20th & 21st September 2014 - we'd be at the Mama's Bazaar which will be held at HarbourFront Centre Shopping Mall Atrium this year. There'd be a 1,000 CitiBlocs there for your kids to try out, and tonnes of other activities for the kids, and shopping for the parents. Remember to key the dates into your calendar while I dust off the cobwebs off my blog! LOL at cobwebs. Looks like a fun event, will try to be there! Yes, I had been waiting for new posts! All the best for your fair.